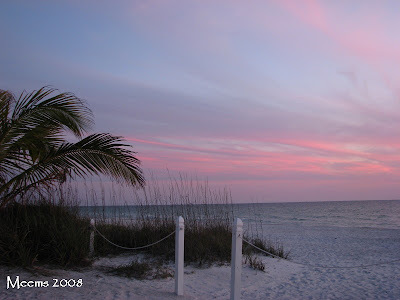 Anna Maria Island with miles of white sandy beaches, crystal clear gulf waters and fabulous seafood restaurants is one great place to visit. 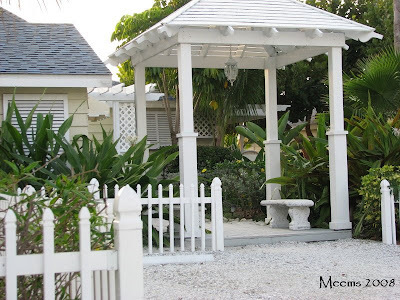 I always look for accommodations that have that feeling of "old Florida" with a laid-back linger-longer sort of style in peaceful cottages. No highrises or condominiums for this beach goer. No, I look for wood floors, lots of windows, porches, foundations built off the ground, small properties and lots of lush foliage. If you are a regular reader of Hoe and Shovel you will remember that I am a Florida native and a lover of all things "beach". Which makes it a good thing I live in Florida. Hubby and I are beginning to fit right in with the 'snow-birds' making our weekend get-away trips to beaches in the winter like all the northerners. 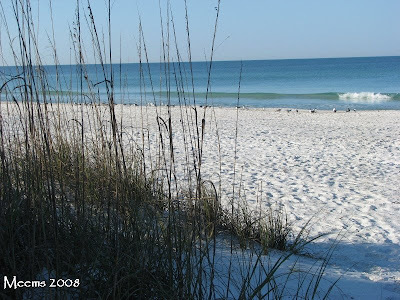 While I recommend our beaches anytime of the year (except July and August when the heat makes it a lot less fun) the winter is a perfect time to enjoy Florida's great beaches. I can see why it is the height of tourist season. As a side note: Just in case you want to plan a trip to Florida- the fall is a beautiful time to be on the sand and surf too and the rates drop dramatically. 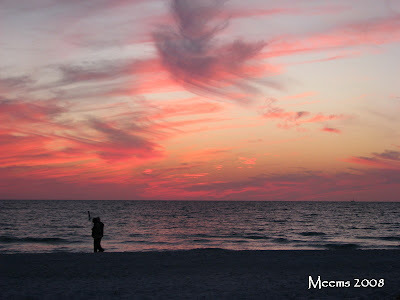 This past weekend we stayed on Anna Maria Island. The weather was 'Florida perfect' with 50's at night which gives us cool mornings and 70's by mid-day. A Floridian couldn't ask for more! 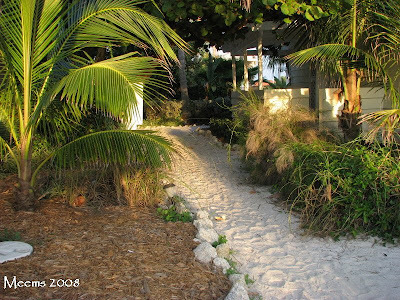 The simple garden pathway leading to the beach from our cottage. 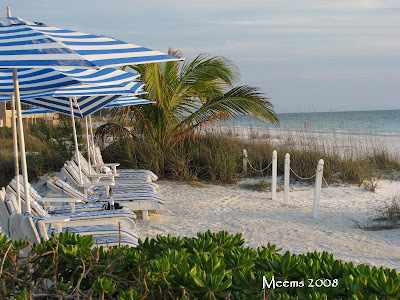 A pleasant 1.5 hours drive south of the Tampa Bay Area you will find what I conclude as some of the best coastline beaches in Florida. We often make day trips to this area due to the convenience and smaller town feel as compared to the Clearwater/St. Petersburg area in Pinellas County. Don't get me wrong, there are some wonderful places there, too. We just prefer Manatee County beaches. The private area for sunbathing. I took this photo very early before the loungers stake their claim to a chair. 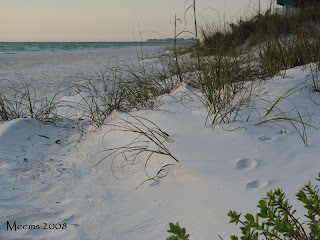 If this powdery white sand with tracks in it were not dappled with sea oats and gulf waters in the background one might mistaken it for snow. It's what I think of when I see it anyway. 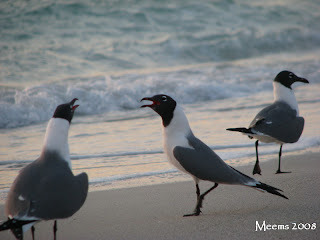 Laughing Gulls making their squawky music together in their early morning glee. Or maybe that was me with the glee and the birds with their squawking??? We witnessed an extraordinary sunset as so often happens this time of year. This is the beginning of how it unfolded on this crisp, clear Saturday evening. In the minutes prior to the sun rotating out of sight all the wildlife seems to come alive with activity. The birds are especially visible scouting about for their last meal of the day. It was one of those sunsets that painted the sky from its setting-position to the other side of the horizon with vivid pinks, purples, orange colors & cloud designs --we couldn't stop ooooing and awwwing. "Oh, look over there." "Wow, look up at that cloud now." "Look, look how deep those colors have gotten." And on it goes admiring the handiwork of God. As is the case so often with sunsets here-- the variations of color progress and evolve long after the sun is set. As every minute passes, more color and deeper colors appear. So refreshing is the sun, the sand beneathe my feet, the salty air, the birds and their song. My soul is renewed from the rest, the walks on the beach, the uninterrupted lounging and reading, the lush tropical greenery and flora that accompanies beach habitat. I'll post next on the birds, trees and such... stay tuned for part 2. Gorgeous! I'm jealous! Wanna trade places? You can have our snow, and I'll take your beaches! THAT'S OUR BEACH!!!! Oh you are making me want to be there in the worst way. My aunt and uncle live in Bradenton for half the year and they are wanting my grandma and me to come down now. I'd love to, but grandma (at 93) just isn't up to it anymore. Well, I think she could do it, but she doesn't think she could, so that's that. Thanks for letting me visit virtually. That is a magnificent sunset. I'm not really a beach person but your pictures could make me change my mind. I'll gladly trade my snow for yours. Glee would be the word for any and all who would visit that wonderful place! Are you worried it will get too crowded after your rave review? 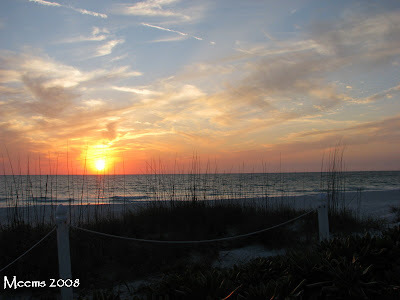 ;-> Our next trip to Florida, always for college bowl games, should include a visit down there, must make a note to self! Thanks for the travelogue. You just reminded me about a plant I want to put in a shady spot of my garden. Thank you--I had forgotten about it. I'm glad your garden is giving me inspiration while I wait on mine. It is fun to come here and I have been admiring the pics on your sidebar for some time now. Now I've got sand in my shoes thanks to you! It's about a 5 hour drive for us to get to the neareast beach. We don't have that pretty white sand though. Some NC beaches are very rough. You got to have on your shoes to walk on them. Thanks for the tour. Oh Meems, this post is absolutely beautiful. This time of year especially is when I envy you your Florida tropics. AAAaaahahhhhhhhh. Hello, Had to stop by...Wow, what fantastic photos and places. Lintys: I actually would like to have your snow for a little while. I always enjoy snow vacations- especially when there is good skiing. Kylee: Too bad you can't talk G'ma into the travel but I totally understand how she has decided what she is up to and not. You have a perfect opening with relatives living in that wonderful little town... Let me know if you change your mind! Frances: We are HUGE college football fans (well hubby more than me but I follow along for the fun) -hmmmm I am wondering which team you might be following? Yes, you must take time to visit the beauty of our area. Sophie: I have a feeling you stay homesick. ;-) Wouldn't it be funny if I had enough readers to actually bring more tourist here? Joey- thanks- I sure hope you don't repeat your "dig out" this weekend... and here's to a more romantic weekend in your beautiful little cottage. Anna: I can sense you are antsy about getting started with your new garden and I don't much blame you. Now's the time to make your plans and enjoy the rest from your toils. The NC beaches are lovely but not the same for sure. 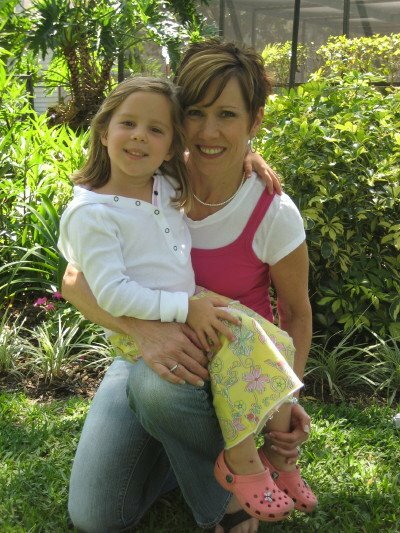 Lisa: This time of year IS the time for us and I must admit as much as I am singing Florida's praises now I will be wimpering pathetically in the middle of the summer. Selah! 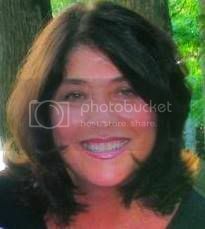 Gail: Thanks for stopping by and yes, happy to have you add me to your blog roll. Hi! I enjoy reading your blog so now I'm tagging you -- you're it! If you're interested in responding, just post 10 (or so) random facts about yourself on your blog. Then invite a few other bloggers you appreciate to do the same and the fun carries on! BTW - I love the photos! I wish I were there with you with glass of wine in hand! 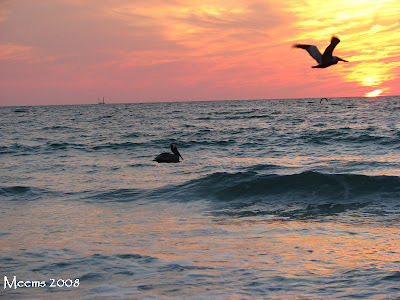 Fabulous photos, I loved feeling the sand under my feet and hearing the birds...I can smell the ocean, too. Emily: Hi and thanks for visiting. Always happy to know other Florida bloggers. Have to warn you I'm not great with the tag thing but I'll give it some thought. Layanee: This place would be the perfect place ... only I would have a cup of coffee in hand while you enjoyed your wine. Holy cows-- that sand is amazing! You capture the beautiful colors of Florida so well. Hanako: Thanks for the kudos. Florida DOES have some beautiful colors -especially right now.